The Drumstick Truffleclub is found mainly in conifer woodland, particularly with spruce trees. Growing from underground False Truffles Elaphomyces granulatus and other members of the same genus, this parasitic ascomycete is easily overlooked in mossy woodlands or areas deep in needle litter when its brown cap hardly protrudes through the surface. Excavate the long yellow stem and you always find an underground (hypogeous) fungus, sometimes with several Drumstick Truffleclub fungi emerging from it. 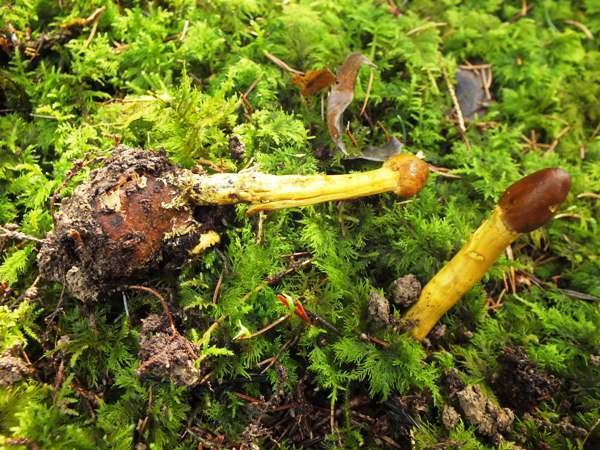 An uncommon find in Britain and Ireland, Cordyceps capitata is found in coniferous woodlands throughout most of mainland Europe; it is also widely distributed in North America. Danish naturalist Theodor Holmskjold (1732 - 1794) described this parasitic fungus in 1790, giving it the binomial scientific name Sphaeria capitata. It was German mycologist Johann Heinrich Friedrich Link (1767 - 1850) who in 1833 renamed it Cordyceps capitata, which to the present day remains its widely-accepted scientific name, although some mycologists now refer to the Drumstick Truffleclub as Elaphocordyceps capitata (Holmsk.) G.H. Sung, J.M. Sung & Spatafora. Other synonyms of Cordyceps capitata include Torrubia capitata (Holmsk.) Cooke, Sphaeria capitata Holmsk., and Cordyceps canadensis Ellis & Everh. The generic name Cordyceps comes from two Latin words: the cord- part means a club, and the suffix -ceps means head. So club-head fungi they must surely be. The specific epithet capitata comes from Latin and means 'having a head'. The binomial is somewhat tautologous, therefore, as its literal translation is 'club-head fungus with a head'! Ranging from 0.5 to 1cm in diameter and up to 2cm long, the ovoid fertile head is brown with a rather glossy surface that is dotted with fine pores (the openings via which spores leave the perithecia). 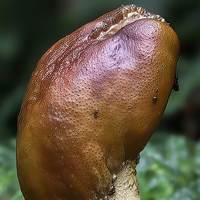 The yellow infertile stem is 2 to 8cm long and 0.5 to 1cm diameter, cylindrical and fairly smooth but lined faintly with brownish longitudinal fibres; its base is always attached to an underground Elaphomyces species (a kind of truffle). The individual perithecia are ovoid, typically 800 x 350µm, and partially buried (sometimes completely so) in the surface of the head of the stroma. 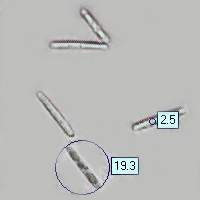 The ascospores are multiseptate (segmented) and filiform (in the form of long threads) eventually breaking into cylindrical part-spore segments (separating rather like a string of sausages), each segment typically 19 x 2.5µm. Parasitic, in coniferous woodland, always attached to an underground Elaphomyces fungus (a kind of truffle). Summer and autumn in Britain and Ireland. Cordyceps longisegmentis is indistinguishable macroscopically from Cordyceps capitata. 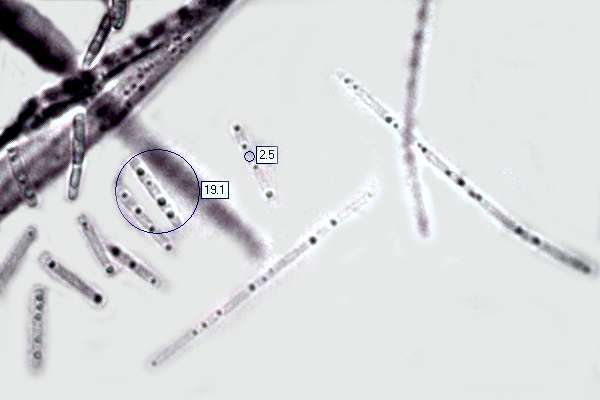 The two species differ only in the sizes of their spore segments - the partial spores of Cordyceps longisegmentis are, as the specific name implies, very long at 40-50 x 4-5µm. 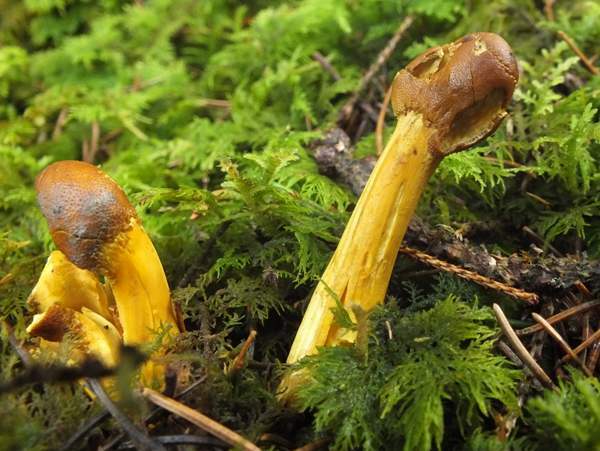 Other than for their uses in traditional Chinese medicine, Cordyceps fungi are not generally considered to have any significant culinary value. Sung et al., 2007. Phylogenetic - Classification of Cordyceps and the clavicipitaceous fungi. Studies in Mycology, 57(1), p.5-59.